Congratulations, momma! You did it. You’ve ushered a miracle into this world. That newborn baby in your arms is a game changer, a tiny slice of heaven and the purest thing you’ll ever know on this side of eternity. My guess is that you spent your pregnancy preparing for this moment. You’ve read the books. Sought the advice. Chosen your pediatrician and educated yourself on baby gear. Yet even so, you’re worried and overwhelmed. This world seems so unfit for a baby – especially your baby – and there’s too much that can go wrong. So what does the future hold? What can you expect? Clearly, your family’s story will be unique, but what I can touch on common experiences and feelings, things I wish someone had told me when I become a mom. 1. Having a baby is hard work. And with your first baby, there’s a steep learning curve as you learn to care for another human being while functioning on limited sleep. Give yourself room to grow, and show yourself grace. Lower your expectations of what you can accomplish in a day. Most importantly, rest whenever you can (I found the advice “Sleep when your baby sleeps” very helpful). Newborns are adorable and exhausting. Even if you feel like Wonder Woman, sleep deprivation will catch up with you if you ignore your body’s needs. Find a system that works for you and accept any help that family and friends offer, especially on things like meals, laundry, and running errands. 2. That ideal parent in your head is a figment of your imagination. Perfect parents don’t exist, and while there are many parents who you can and should learn from, you’ll never meet anyone who has all the answers. You’ll never meet anyone who’s raising their kids exactly the way you hope to raise yours. 3. Children are blessings, not burdens. While this is easy to remember on good days, the hard days are another story. When my four kids were small, there were mornings when the pitter-patter of little footsteps charging toward my bedroom put a major pit in my stomach. At 6 a.m., I dreaded the day. I needed a pep talk to get out of bed. Kids challenge you at every age, but the early years can be particularly taxing. What helped me most was keeping my mind in a positive place. I exercised, invited friends over for playdates, and wrote fiction at night as a mental escape. I also befriended moms with a good sense of humor to make me laugh when I wanted to cry. 4. Online community is great, but real-life community is priceless. I love social media, but I’m glad it didn’t exist when I became a mom. I’m glad that when I felt lonely, sad, or confused, I hadto reach out to friends and relatives rather than click online. I could stroll my baby without feeling an urge to check my phone, film her first steps for personal pleasure and not Facebook “likes”, and form my identity as a mom without being confused by 50 million blogs and constant comparisons to moms in my news feed. The world is different now, and while online communities can offer tremendous support and timely advice, they’ll never meet your needs like real-life interactions. Enjoy your online community, but remember your best interactions will always happen in person. But as you age, you see “the good life” blow up as people face problems that money can’t solve (i.e. death, infidelity, divorce, cancer, wayward kids, a scary diagnosis, a mid-life crisis). You realize what matters and clearly see that what kids need most isn’t private bathrooms and luxuries, but attention and love. And since both of those are free, they can dwell in even the humblest home. 6. The best mom friends are compassionate, not competitive. Let’s face it – we all have a competitive monster that gets stirred whenever we feel inadequate. And when you see a child hit milestones before your child or meet a mom who’s more together than you, it can make you feel the need to prove yourself. But remember this: The purpose of friendship is to bless, not to impress. And what you need, above all, are mom friends with that attitude. Moms who cheer you on and cheer you up. So be an encourager, and surround yourself with ladies who do the same. 7. Your child is a work-in-progress, and so are you. Accepting this upfront makes any moment of disaster easier to handle. Nothing cures perfectionism like motherhood. At some point in your near future, your child will start to do things that humble you (like having a meltdown in Target) disgust you (like inviting you to a tea party with water they scooped from the toilet) and hurt your feelings (like giving you the cold shoulder). Motherhood is wonderful, but it’s also messy. Like everyone, your child is human, full of conflicting thoughts, emotions, and impulses. Just when you think you have them figured out – they’ll do something to surprise you. You’ll start your journey believing you are the teacher, but with time you’ll realize how you’re a student too, a student with many lessons to learn. 8. Watching your baby grow up is bittersweet. It’s also a GIFT. Babies and kids change daily. They grow by leaps and bounds, and nothing slows that train down. Rather than mourn the past, celebrate the present. See the positive in every stage and remember what a privilege it is to witness a child growing up. As much as I loved my daughters as babies, I love them even more now with their personalities in full bloom and glimpses of who they’re becoming. So snuggle with that bambino on your chest, all swaddled in pink or blue and so deliciously warm, and treasure this point in time. Know that you’re off to a magical beginning – and yet the best is still to come. The struggle of motherhood is real, but the rewards make it worth it. You have so much to look forward to – first words, tender kisses, bedtime stories and Christmas morning – but for now bask in the glow of that angel in your arms, whose innocent eyes and dependence on you will turn your world upside down. Also, I’ve written two books for teen & tween girls designed to empower them through faith. 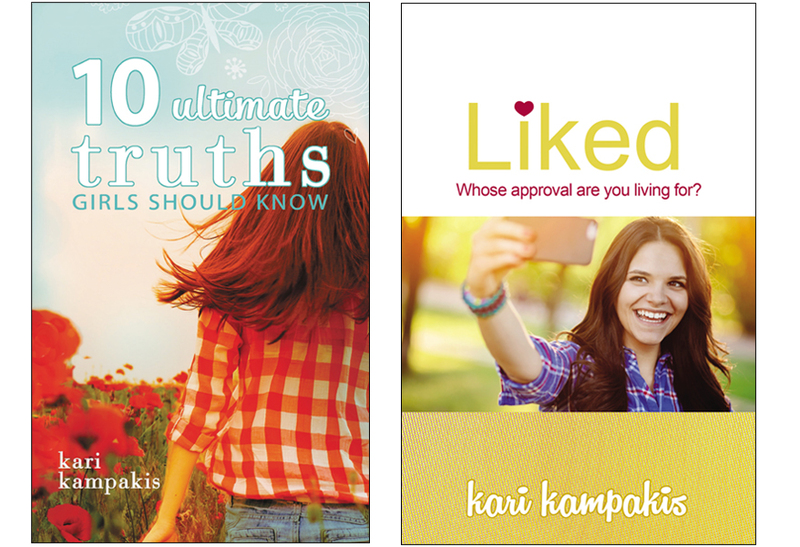 The newest one, Liked, is getting a fantastic response as a unique resource for girls of the digital age, and along with the bestselling 10 Ultimate Truths Girls Should Know, it’s being used widely across the U.S. for small group studies. Thank you for writing this. Needed to hear those words of encouragement framed in faith. My heart, spirit appreciate it. God bless and guide you always. Thank you for your beautiful words. This is such truth and so needed. I just became a mother (at 30 as well) a year ago and it is truly hard in this over-informed age to find your own voice above the noise. Everyone speaks to you about the birth, the birth, the birth. And, the gear you must have. But, few people stand up and say “the first year will shock you to your core.” And, if the hormones don’t hijack your emotions, the shock will. Very few women stand up and take your hand and say “we are all just figuring this out as we go and it isn’t always pretty facebook smiles and that’s OK.” So, thank you. I actually came to your site because I bought my younger sisters your Liked book and was researching other teen resources. They love your book and it speaks to them with truth they desperately need. Thank you for being a voice to this generation and for encouraging me as well with this wonderful article. Thank you very much for your wonderful words of encougement for a new mom.I thank God a lot because my pastor choose me to give an words of encouragement for this coming Mothers Day.I pray that God give you more wisdom and knowledge to write more articles to help others . I appreciate it a lot God bless you.